I’m a sucker for a cute pincushion. Like this fun sewing mannequin version and this equally adorable mouse. You’ll never lose anything in your purse again when you stitch up this handy organizer. Stitch up a hoodie for your dog – functional (for the winter that’s never leaving) and just darn cute! While this mesh bag is ideal for the beach, I think it would be perfect for laundering delicates as well. Enter to win a box of signature quilting threads AND a ticket to the Mod Bee Quilting conference. It may not be the year of the chicken any longer, but these little stuffies are still adorable. Don’t think you need a chicken stuffy in your life? Fill them with beans and use them as a book chook (it reminds me of one I use for holding recipe books open in the kitchen). While it’s not a tutorial or project of any sort, I found this article on how to square up fabric really helpful. (Then you can go on to make these cute fabric placemats now that everything is true). Tired of snow days? These little sock monsters look like a fun project to work on with your little one. Skip the purse and go with the cool clutch instead. This entry was posted in Uncategorized on February 28, 2019 by stacy. I like prints – I can’t help myself, they just call to me. So sometimes, I have to force myself to work with a solid – and I’m never disappointed with the results (which leads me to ask myself, why don’t I use them more?). Here is my second version of Ellie & Mac’s Lucky Girl Top made in a royal blue knit from Gorgeous Fabrics. This fabric has been sitting in my stash for a very long time – it was going to be used for a color-block dress that just never happened, So it just sat, waiting for the right project. I am so thrilled that I decided to use it for this project because the color is so stunning and it just looks “right” with these fun sleeves. I can’t wait for it to warm up so I can actually wear it out! 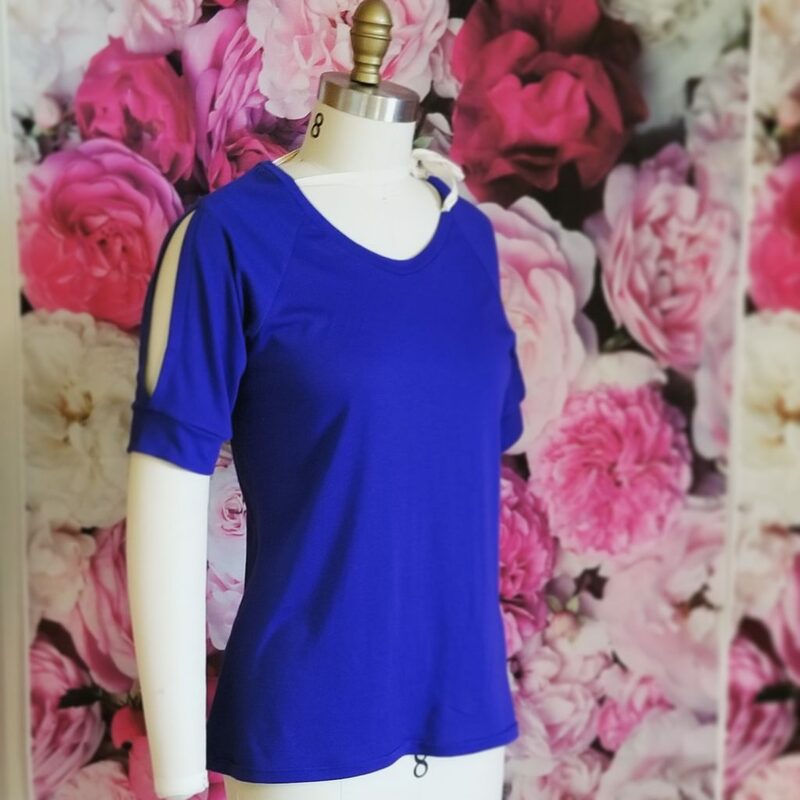 I’ll skip the review of this pattern (you can read more about it in my original post, here), but I should note that I skipped the hem band this time and went with a traditional hem – I definitely think that it makes this version a bit dressier. In fact, I feel like I need a new pair of pants to go with this now! This entry was posted in Uncategorized on February 27, 2019 by stacy. Awhile back I had mentioned that we would be moving sometime over the summer. Even though it still feels like winter, summer is roughly 3 months away so it’s time to get serious about our new home state. That’s right in a few short months we’ll be Buckeyes. This leads me to my next question – anyone in or around the Columbus, Ohio area that I can pick your brain? While I moved around quite a bit as a kid, this in one part of the country that I have never been so I’d love to know more about parts of the city, places that I shouldn’t miss, schools, etc. This entry was posted in Uncategorized on February 26, 2019 by stacy. 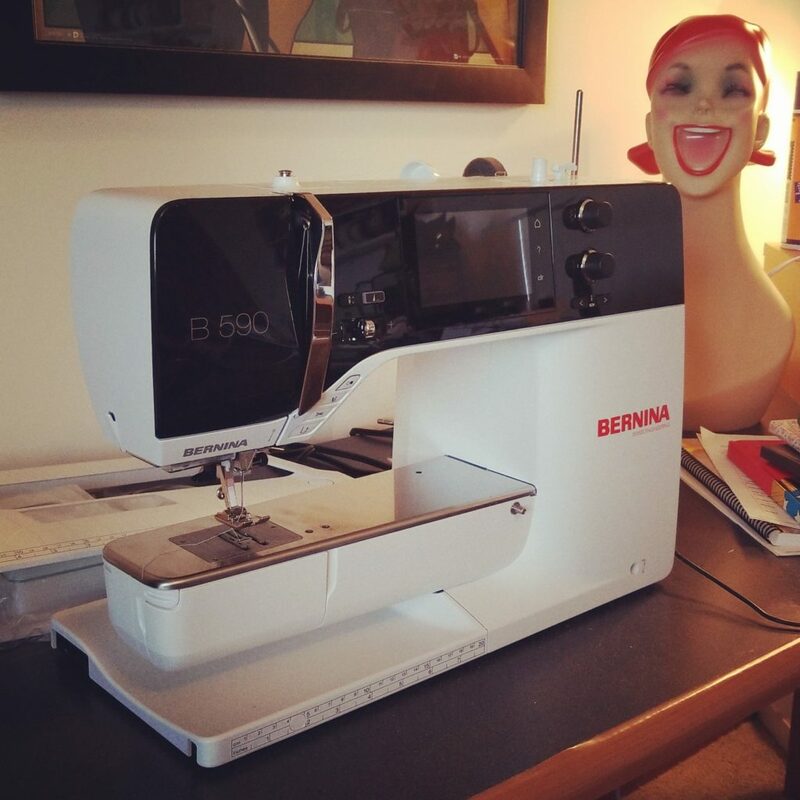 I’ve spent some time with just the sewing unit of the 590 and can easily say that I’m in love… it sews so smoothly and I adore the thread cutting (and the hands free presser foot is nice too)! This week, I’m attaching the embroidery module and giving it a whirl. I am excited to see how easy positioning works (no templates needed, it uses pinpoint placement to match the marking) because it sounds AWESOME! 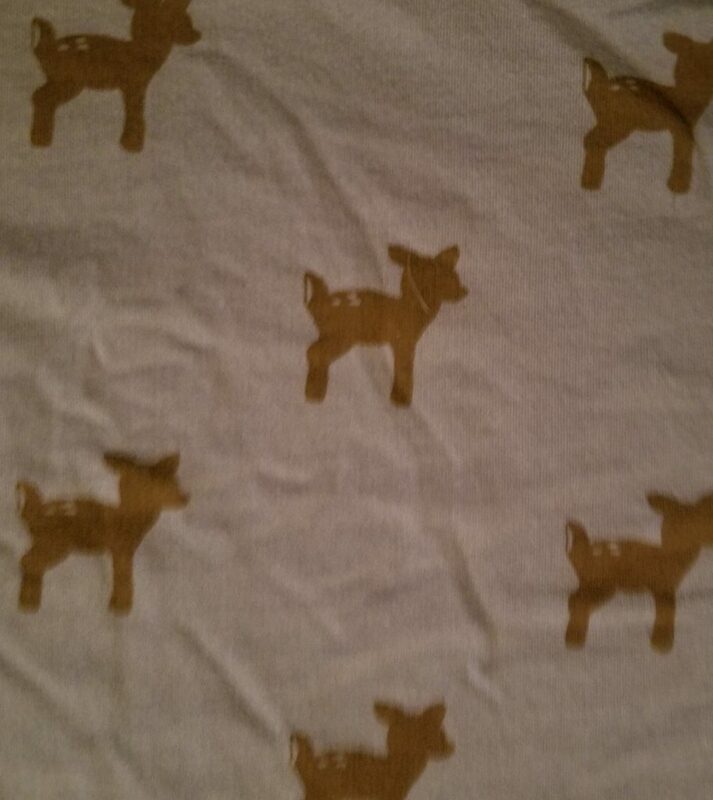 I have my next project cut out (and ready to sew on my new machine): a second Ellie & Mac Lucky Girl. This time around I’m using a solid, royal blue knit that I’ve been hoarding in my stash for ages. I loved the color, just never found the right project to make with it. This entry was posted in Uncategorized on February 25, 2019 by stacy. Learn how to make designer zip bags in this two part video series: Part 1, Part 2. Love the bags, but don’t feel like sewing them yourself? Enter to win them here. This bucket bag is the perfect project to off your fabulous ribbons and trims – plus it has a great spring vibe (and I desperately need some spring in my life!). This wallet doesn’t just hold your business cards, it displays them too! It’s all about sleeves this spring – the more interesting the better! Learn how to hack your pattern to create this striking lantern sleeve. Speaking of interesting sleeves, you’ll definitely want to grab this Arabella blouse while it’s still available – it’s perfect for spring! I’m pretty sure that our dog wouldn’t go for it, but this pet house “igloo” is too adorable not to make anyway. Keep tiny toes cozy with these adorable baby shoes. Stop dragging out the ironing board and make yourself a tabletop ironing pad instead. Since winter is never leaving, how about stitching yourself up a new pair of fleece gloves to keep your hands warm? This ruffle dress is a great addition to any girl’s wardrobe (pattern only fits size 7/8). I love the look of Cathedral Windows, but don’t really have the patience to sew all those blocks up. But this denim circle version looks so much easier that I may reconsider! This entry was posted in Uncategorized on February 21, 2019 by stacy. It’s a dreary, snowy day today, but do you know what makes it a bit brighter? 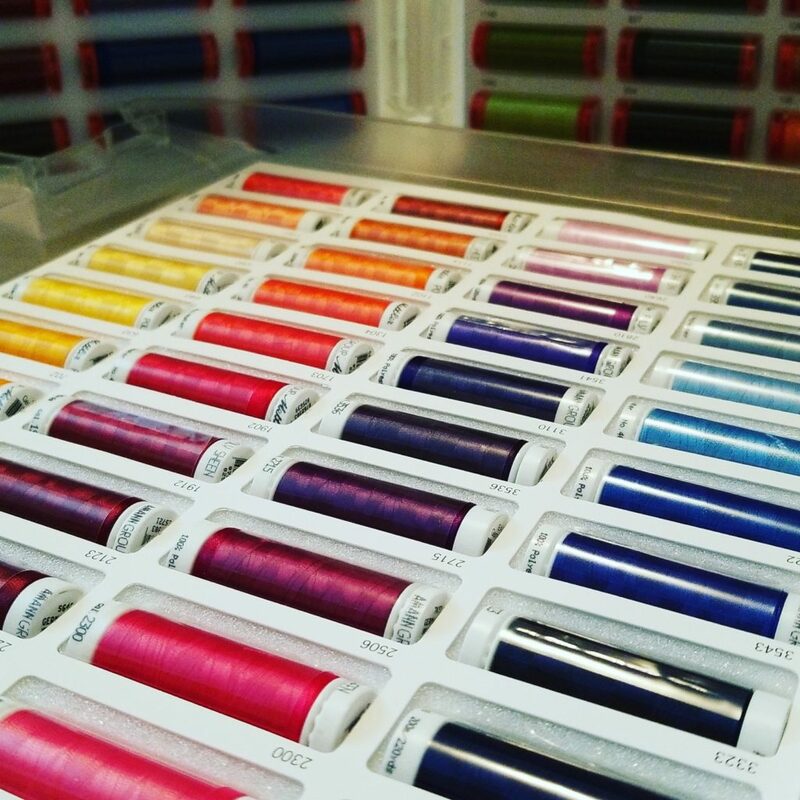 Mettler thread boxes in a rainbow of colors! I am now the proud owner of 3 gorgeous Mettler thread boxes! : Poly Sheen (for decorative sewing and embroidery), Metrosene (an all purpose thread that is my favorite because of it’s high tensile strength and works well with all fabrics), and Silk-Finish Cotton (great for quilting, has a high heat resistance, and reduced shrinkage). Each box also came with a shade card booklet so you can see the entire range of colors available in that thread type. I can’t wait to crack one open and get started playing with them! Now what project to work on first? This entry was posted in Uncategorized on February 19, 2019 by stacy. With the chaos of the last week and half behind us (boxing things up, moving furniture, replacing (almost) ALL THE FLOORING, then un-boxing everything once again), we are finally back to normal around here. Which means, I got to make something! 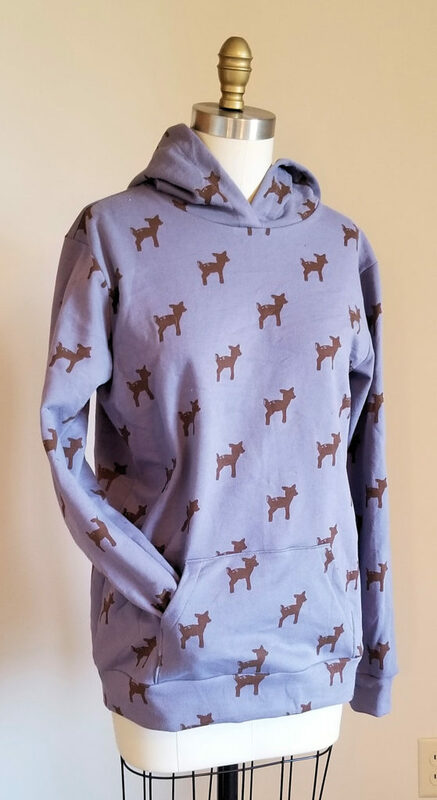 Since winter is never leaving, I whipped up Jalie 3355, a hooded sweatshirt with a kangaroo pocket in a fawn print from The Fabric Fairy (that’s been hanging out in my stash for YEARS). While the material had enough stretch for this project, it just didn’t have enough for the waistband or cuffs so I wound up having to re-cut both of these sections – that way I wasn’t struggling to place them. Otherwise this whole project went together well and I’m set up with a cozy new hoodie for this week’s snow storm. This entry was posted in Uncategorized on February 18, 2019 by stacy. Need a last minute Valentine’s gift? Both the P4P and Dog Under My Desk‘s takes on the heart pouch would make a great gift (or just a cute way to stash a gift). If you have a bit more time to spare, check out this beautiful patchwork heart pillow. Enter to win a Valentine’s Day fabric and thread bundle. Want to know one of the easiest ways to make a little girl’s skirt? Use a scarf. This tutorial teaches you how. When my oldest was a baby, she would cry every time I would strap her into her car seat with a coat on. This fleece lined poncho fixes all that – it’s perfect for babies and toddlers who are strapped in, but still need warmth. Learn how to make gloves (and not the kind you wear for winter!). This Slim Cross-body Shoulder Pouch keeps all the esentials handy, but keeping you hands free at the same time. Enter to win a Babylock Flourish II embroidery machine. Spring break will soon be upon us. If you’re planning a road tip for your vacation, you’ll definitely want to whip up one of these car seat organizers. Keep yourself tidy in the kitchen when you whip on a modern pocket apron. Lunch box looking a bit rough by now? Learn how to sew a new, insulated version. Learn how to transform a tee into a one shoulder, ruffle tank. This entry was posted in Uncategorized on February 14, 2019 by stacy. This week, we are replacing the flooring (mostly carpeting) in our house. While I knew it would quite the upheaval (i.e. lots of stuff moving around, no sewing, etc. ), I was not prepared for this. 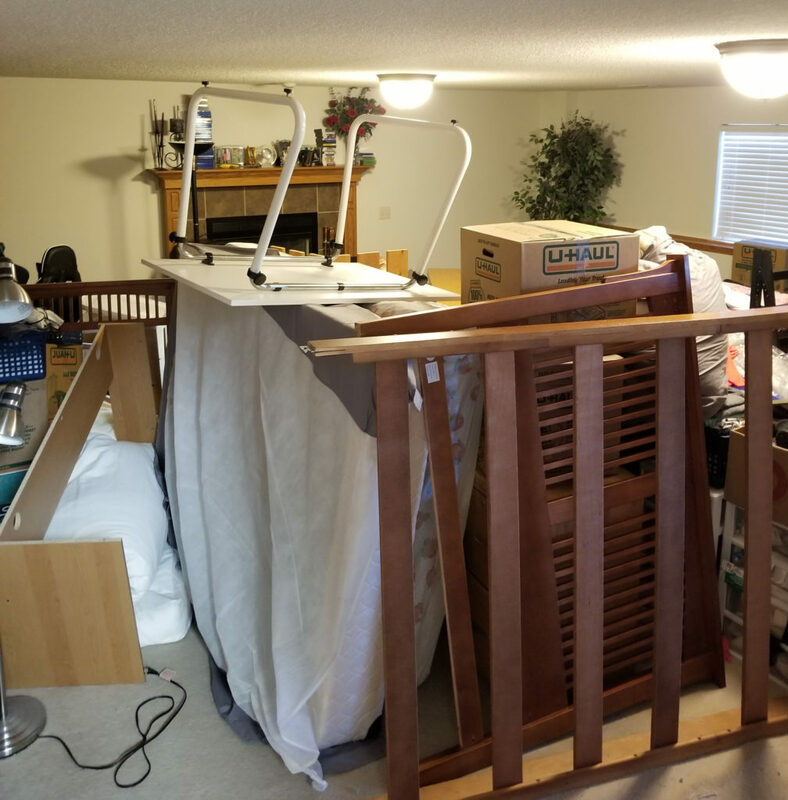 Needless to say, it might be a few days before I get back into the sewing room (and put everything back as well). I keep telling myself that the bright side of all this is pretty, new carpet! This entry was posted in Uncategorized on February 12, 2019 by stacy. I’ve had these little fawns sitting in my fabric stash for ages (so long I don’t even remember how long ago that I purchased it). Initially, I had good intentions of making it into a hoodie or sweatshirt, but never could find a ribbing that might work with it. When I did the sewing stash purge last month, I had a hard time parting with this material, so I rolled it up and put it on a shelf. That is until I realized that our winter was never going to end and maybe I needed something new in my wardrobe. So, I’m finally putting this material to use by making Jalie 3355 – a hooded sweatshirt with a kangaroo pocket. I gave up the notion that I would ever find a coordinating ribbing (it’s an odd bluish\gray colorway) so I’m using self-fabric for this one and hoping for the best. But what is really awesome is the fact that this project only cost $13.99… not bad for a cute little coverup (let’s hope it’s warm)! This entry was posted in Uncategorized on February 11, 2019 by stacy.